Wisconsin Frog and Toad Survey data are analyzed annually to determine anuran abundance and percent occurrence. 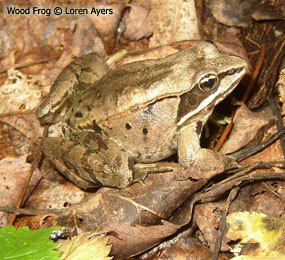 The occurrence of each frog species is determined at each listening station by the presence or absence of their call. Anuran abundance is the average call index for each species. Percent occurrence represents the percentage of routes on which a species is observed. Percent occurrence is determined for each species specific to their peak calling periods. For all methods, we use survey data from the early spring period for wood frog, chorus frog, spring peeper, leopard frog, and pickerel frog; from the late spring period for American toad, gray treefrog, and Cope's gray treefrog; and from the summer period for mink frog, green frog, and bullfrog. Trends are not calculated for the poorly sampled cricket frog. The call index for each species is averaged to provide an index to the route population each year. These route populations are then regressed on time to create a species population trend. Survey data are analyzed using the Statistical Analysis System (SAS). Wisconsin Frog and Toad Survey data have also been analyzed in the past with several more complex statistical methods. For more information on these methods, please read Mossman et al. (1998).